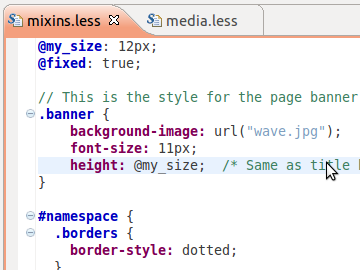 LESS http://lesscss.org is a language which extends CSS with dynamic behavior such as variables, mixins, operations and functions. This plugin extends the Eclipse IDE by providing handy features to edit and compile LESS stylesheets. Listed in Nodeclipse Plugins List. By adding the following code below to your website you will be able to add an install button for Eclipse plugin for LESS. But although I am getting syntax errors in the import from the plugin, that does not appear to be the cause of the problem (it is the same with commented out mixin definitions and calls). For those of you annoyed by the XtextReconcilerJob bug: it can be avoided by entering full file names in your import directives. I.e: @import "stylesheet" will trigger the bug, while @import "stylesheet.less" won't. Same errors here, very annoying! An internal error occurred during: "XtextReconcilerJob". As above, I have to keep closing the warning dialog. I'll be uninstalling until this can be fixed. An internal error occurred during: "Xtext validation". Reverting to version 1.0.19 of this plugin doesn't get rid of the problem, which comes from a dependency on Xtext, which was also updated recently. I recommend not installing either until the problem is resolved. 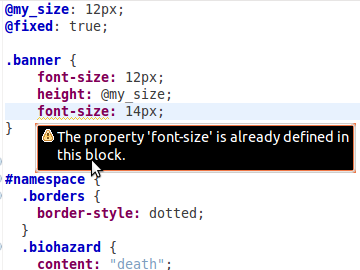 Note that Eclipse shows a syntax error on a perfectly valid .less snippet that contains a mixin. I get repeated errors in latest build, so often I had to uninstall. Can we downgrade?